Ekal Vidyalaya Foundation of USA’s National conference was held in Chicago from 20th of September to 22nd September, 2013. They also celebrated the150th Birth Anniversary of Swami Vivekananda. The event was well organized by Dr. Hashmuk Shah and the team of Ekal USA, Chicago Chapter. Volunteers from across the USA attended the conference. It started on Friday, 20th September. The events were held at the Holiday Inn. The highlight of the program was the presence of Sri. Shyam Ji Gupta, the inspiration behind the Ekal Movement. Sri. 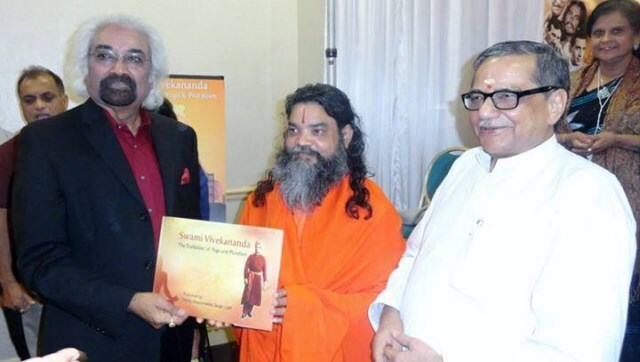 Sam Pitroda graced the occassion. Ekal India was represented by Sri. Pradeep Goyal, EVFI, Sri. Naresh Jain and Sri. G.D. Goyal, BLSP, Sri. Ajay Singh, Ekal Sansthan, Sri. Yatin Jain, Youth For Seva, Sri. Sankaran, FTS Chennai and Sri J.K.Jhaver, Gramothan Foundation of India. On the 21st, the members were taken to “The Art Institute of Chicago” where Swami Vivekananda delivered his historic lecture at the Parliament of Religions. Sri. Shyam Ji Gupta delivered a vibrant speech on the action plan to meet Ekal’s dream of serving 3 million villages in India. A statue of Vivekanda was gifted to the Art Institute by the Ekal team. The members were taken to the Vivekananda temple and meditation hall. Rajani Kane has stopped donating to Ekal through her Husband’s credit card! Instead she had chosen an innovative way. She started doing something which is her forte – COOKING.! She makes nutritious and delicious vegetarian food, selling it and donates that money to EKAL. Oh, is it not food for education! As you enjoy her food, a tribal child is blessed with education. 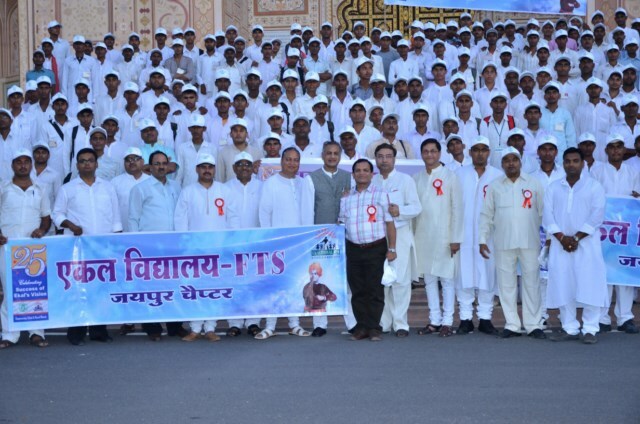 Jaipur FTS Chapter celebrated its Silver Jubilee in accordance with Swamy Vvivekakanda’s 150th birth anniversary on 18th September 2013. 250 teachers from all 5 Anchals were invited. Shri. Rameswar Lal Kabra ji, Shri. Bajrangi Bagdaji and Rajasthan zone in-charge Dr. Surya Prakash Sharma ji graced the occasion. Program started with patriotic songs which was followed by a skit “Mein Ekal Vidyalay hoon”, (I am Ekal vidyala) presented by tribal students. Skit was appreciated by the audience. Later Smt. Manju Didi spoke about necessity, use and availability of Ekal Vidyalaya. Chairman Shri. Birendra Kedia welcomed the guests. Secretary Shri. Pradeep Baheti summarized the activities of Jaipur Chapter. Shri. Sanjay Patel of Indore coordinated the program well. People came forward to take the sponsorship of many Ekal schools. Shri. RajkumarTengia from Rajasthan announced to sponsor 100 Ekal schools. Shri. Ramdas Agarwal announced to sponsor 50 Ekal schools. Rotary 3052 province member Shri.Anil Agarwal sponsored 11 schools. The program was successful and the Jaipur Chapter is very confident to achieve the target of 500 schools through this program. Swami Vivekananda wanted 100 men with ‘CAPITAL M’. Here is ONE. Inspired by Swamiji’s thoughts and principles, Sri Shyamji Gupta is guiding Ekal Vidyalaya Movement for the last 25 years. In his vibrant speech at the ART INSTITUTE of CHICAGO where Swamiji delivered his maiden speech at the World Parliament of Religions, on September 11, 1893, Shyamji shared his dream of the future of India and how to make it possible. A renowned industrialist Sri Vaidhyanathan, a shy philanthropist, reluctantly agreed upon insistence of his family members to celebrate his 60th birthday (Sashti Abdha Poorthi). He took this opportunity to be of service to humanity and adopted an ingenious and generous gesture of introducing his friends and relatives at this function to help Ekal Movement and donated the gifts received in the function to Ekal. In his invitation, he had made a specific request not to give gifts or money to him on the occasion, but if keen, they were requested to donate to Ekal. Nice! The relatives and friends of Sri Vaidyanathan ji liberally donated to the tune of Rs 1.35 lacs. These were the contributions of the good hearted people given on the occasion of Sri Vaidyanathan’s birthday. 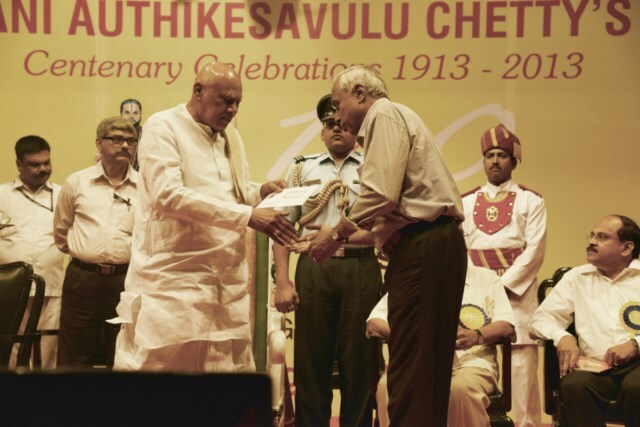 Sri Kakumani Adhikesevalu Chetty Charities celebrated their Centenary recently when the Governor of Tamilnadu Dr Rossaiah presented a cheque for Rs 16000/- to the Secretary of Ekal Vidyashram (TN SVO) Sri.T.V.Seshadri, on behalf of the charity. 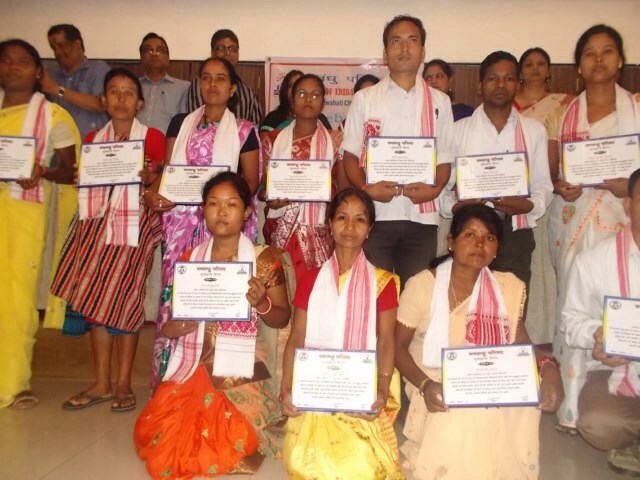 Guwahati Chapter honored the most important people of the society - THE GURUs on the Teachers Day. The office-bearers of the chapter were pleased to present the certificate of appreciation during the function. Inspired by Swami Vivekananda’s principles, Ekal Vidyalaya made a humble beginning in the year 1988 in Jharkhand (now). Two years later, Shri Madan Lalji Agarwal established similar schools in 60 villages near Dhanbad. By 1995-1996 there were 1200 schools being run in Jharkhand. In last decade, organizations from all over the country have joined the Ekal Vidyalaya movement. The Ekal Abhiyan Foundation serves as the umbrella organization for various NGOs that run One-Teacher schools in their respective areas. Today, Ekal runs One Teacher School in 50,680 remote tribal villages of India. Currently, there are over 1.5 million children getting benefited through this movement. In the last 2 decades another 1.5 million children got the informal education from Ekal and got into regular stream. Ekal always promotes Self-Reliance. It discourages continues support of funds from sponsoring agencies for longer duration of time. This is visible when we see the statistics as of July 2013 which says 37% of the villages run with the donations from local/regional funding agencies and only 63% support from center. With 5 lakh youth volunteers and 1.2 million people from local community, Ekal is sure to achieve bigger goals. When my mom said we will be visiting Ekal during our trip to India – I was very excited. We were finally getting to see an Ekal School after serving as volunteers for Ekal over 4 years from Dallas. Meeting the kids of the village Sillan Kuppam, Cuddalore, in Tamilnadu, made us so happy, after our anxious ride. We settled down and the students engaged us by singing, dancing, and two girls even gave speeches on a Mathematician and an Indian lady freedom fighter. They did all of these with a great smile on their faces. When one of the kids forgot her lines, her classmates asked her to finish up with Namaste – but she hung on despite her embarrassment, recollected and finished her speech. It was wonderful to see such determination. How hard life must be for these kids? Upon talking to a few of the kids, I found out that despite all the challenges, these kids were highly motivated to have a good education. As our time was limited and it was getting dark, we started distributing pencil bags, sweets and chocolates. The kids were ecstatic and eager on receiving them. Their sense of gratitude, openness to strangers and cheerfulness amazed me. My friends and I take our privileges for granted. But after seeing these kids made me see my everyday life through a different light. Going to the Ekal School was the most heart changing experience I have ever had – it has taught me that hope always exists where there is motivation and positive thinking. It has made me want to see if I can do more to spread the word of service to others also. I am happy to be a part of Ekal volunteer group, making a difference, at least in the life of one small village at a time. In the form of the Parinam Parva Sammelan it will be a floral tribute paid by the 25-year old son to its psychic progenitor, Swami Vivekanand. This festival is designated as ‘Parva’ because the participants – who prior to coming to the mega assembly were used to seeing their respective small communities in isolation – would now witness their own ‘Parvataakaar Roop’ (mountainous form) amidst the atmosphere of mega togetherness. The Gram Devatas in their respective full gear decorated with eight ornaments – would land at the Parvas to advance its cause and also bless the participants for all success. The finale program would be a humble salute to the birthplace of this movement – the Gangotri of this Ganga – that is the holy land of Dhanbad district in Jharkhand State. Ratanpur-Tundi school, WAS ESTABLISHED BY SRI. MADANLALJI AGARWAL IN THE VILLAGE WHICH WAS OUR FIRST EKAL VIDYALAYA STARTED IN NOV. 1988. Achievers of village organization and members of urban organizations participate.